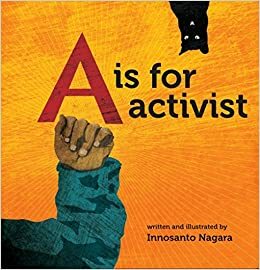 With the help of a Kickstarter Campaign, Innosanto Nagara’s A is for Activist was published in 2012. As the title suggests, it is the obvious alphabet book choice for any budding social justice warrior’s collection. The illustrations are warm, earthy, and varied in style without being incoherent. Every letter in the alphabet has a designated page (or two-page spread) containing a short poem or chant, corresponding image, and random black cat. Although I enjoy his illustrations, it would have been useful if Nagara had formatted pages consistently, for instance with capital letters clearly written and prominently placed, to help young learners orient themselves to the text and the primary lesson seemingly being taught – the alphabet. Spotting the letters is almost as challenging as spotting the cat, which doesn’t seem purposeful. Indeed, the overall quality of the text is a tad uneven. Some of the chants are clever and fun, but others flop. It starts off well enough: “A is for Activist./ Advocate. Abolitionist. Ally./ Actively Answering A call to Action./ Are you An Activist?” This is fun to read aloud and introduces the text well. On the other hand, Nagara struggled with the letter T: “T is for Trans./ For Trains, Tiaras,/ Tulips, Tractors,/ and Tigers Too!/ Trust in The True/ The he she They That is You!” This is Nagara’s attempt to engage transgender identity but getting there requires a lot of interpretive work; far more than my three-year-old is bringing to our reading sessions. And, reading it aloud feels clumsy. It’s an imperfect text, but it’s worth the journey and in my house we’re likely to read it for a few more years. Progressive values are consistently and unapologetically expressed, and the issues presented for discussion are urgent and diverse. I would not recommend the text for the traditional ABC board book set, 0 to 3-year-olds, but instead for children 3-plus who are already familiar with many of the concepts introduced, which include environmental justice, feminism, grassroots organizing, and unions. It’s a good book to reinforce progressive social values and prompt discussions, but not a useful tool for learning the alphabet.